On entering the church, one's first impression is probably of its cathedral-like size, the length from east to west being 179 feet (55m), the greatest width across the transepts being 109 feet (34m) and the height of the roof over the nave being 72 feet (22m). The tower is placed in the north-east corner of the church which now seats up to 700. The high altar below the great east window is of marble on a wooden frame. The reredos is of alabaster, marble and Italian mosaics with pictorial panels of the four Evangelists. 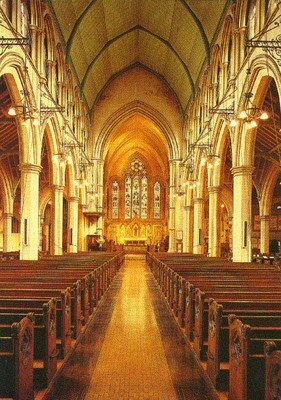 The altar and reredos formed part of Sir George Gilbert Scott's original design, and were completed by his grandson Giles. The Florentine crucifix was added later. Two mosaics to either side of the reredos are memorials dated 1882, by Salviati from Venice. The sanctuary murals include, on the north wall, a large wall painting in oils entitled Feed my Sheep, showing the Risen Christ with 11 Apostles and with sheep grazing and resting. This mural has recently been restored and relit. Two other wall panels on the south wall of the sanctuary and on either side of the sedilia are of the Virgin Mary and St Catherine. The murals were painted by John Clayton jnr. The lectern was given to the church in memory of Mrs Elizabeth France who founded the Chapel of St Elizabeth of Hungary in the Kensington workhouse (later to become St Mary Abbots Hospital). Mrs France was the wife of one of the workhouse guardians. The brass eagle follows the design of an earlier example in the Chapel of University College, Oxford, the pedestal following a similar example in Eton College, Chapel.